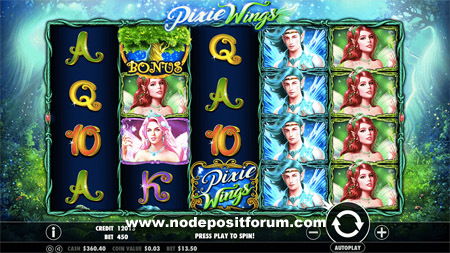 Pragmatic Play’s Pixie Wings online slot takes players on a mystical journey through an enchanted forest, where the possibility of incredible riches await every player. This 50-payline slot gives us many chances for players to win big, thanks to its stacked symbols, and free spins bonus round. Pixie Wings is available to play on just about any tablet, smartphone or personal computer. Pragmatic Play which features delicate art in sparkling, fantasy style graphics. As with many tales, this colony is led by a family of royals: there is a king, his queen and a prince. Of course, no story would be complete without a beautiful young princess! These characters each appear on the reels with varying values, while the remainder of the reels are set up with traditional playing card symbols. It also features an interactive background of fireflies, butterflies and fairies fluttering in the distance along with symbols that become animated when involved in winning combinations. The mystical look of this game is really quite beautiful and will certainly keep you wanting to spin those reels. Players can trigger an exciting bonus round with up to 12 free spins, and the chance to win some amazing bonus prizes. A nice addition to this game is that the high paying symbols also pay out for 2-of-a-kind winning combinations rather than just 3-of-a-kind and higher, so there are even more opportunities for big wins during the base game. When three or more scatters land on the reels, you’ll trigger the free spins bonus feature. You’ll be able to pick one of five options which offer a different number of free spins and a new stacked symbol. The gold pixie is super stacked for 5 free spins, the pink pixie is super stacked for 7 free spins, the blue pixie is super stacked for 9 free spins, the green pixie is super stacked for 11 free spins. A random option where any of the pixies or the logo symbol is super stacked for anywhere from 3 to 12 spin. Since the gold pixie offers the highest payouts and the green pixie offers the lowest, you’ll want to think carefully about which free spins round you prefer. The question is would you rather have fewer chances to win bigger prizes or more chances to win smaller prizes? A tough question. You’ll be able to find Pixie Wings at any online casino that carries slots powered by Pragmatic Play like Black Diamond and Box 24. The game is well done and winning potential is good. I find myself wanting to visit this enchanted forest over and over again.